The role of scholars or “sheikhs ” emerged in the early stages of the Syrian uprising in 2011 due to many factors, including the systematic absence of societal actors during the Ba’ath’s rule. Due to their role in the uprising the scholars where the first to be invited by the regime to have dialogue, as well as tribal elders both representing the local councils. The first few months of the revolution witnessed the issuance of many fatwas in addition to the emergence of collective and individual religious positions. The most prominent collective position taken by scholars was the statement issued and signed by 25 sheikhs (from Homs) on April 16, 2011. They put forward 16 demands which included: allowing peaceful demonstrations, repealing article 8 of the Constitution which states that the Ba’ath Party is the leader of the State and society, lifting the state of emergency, curtailing the role of the security services, allowing Syrians to return back from exile, releasing all detainees, and holding to account the criminals . Those sheikhs presented a national discourse that demanded the Syrian State and society to be more responsible. The role of sheikhs focused on alleviating the violence of security forces and preventing the angry youth from using arms. The constant violent practices by Al Assad’s regime, ignoring sheikh’s initiatives, and the entrance of external religious sides that urged the youth to take up arms have weakened Sheikh’s role considerably and forced them to leave and abandon the religious scene in Syria. The emergence of Sharia leaders coincided with the militarization of the uprising against Assad. The role of this leader is to fill the gap caused by the departure of sheikhs from the Syria. Sharia leaders played a role similar to imams and sheikhs in the Syrian society and added other new roles. The phenomenon related to the spread of Sharia leaders has not been researched well through the past years due to many reasons including the fact that those leaders did not form any autonomous group and their roles are similar to their factions. It is thus hard to determine a certain role for the sharia leader in Syria. Very few studies focused on those leaders due to the ambiguity of their situations and their origins, as they were known by their surname names in the local community rather than there first name. . It should be recalled here that some local sharia leaders have promoted their factions because of their popularity in the regions such as Abdul Rahman Atwan (Abu Abdallah Al Shami) who comes from a well-known family in Idlib. This study tries to highlight and specify a general framework of studying sharia leaders in order to motivate researchers to conduct more research and studies about this phenomenon. It also seeks to encourage sharia leaders to talk and write about their own experiences. In Jusoor for Studies Center, we believe that the experience of sharia leaders does not form an internal issue for the Islamic factions. Rather, it affects all Syrians who have suffered or gained benefits from the outcomes of this experience. The next Syrian generations have the right to know about the details of this experience. This study does not address all details related to the sharia leaders. However, it focuses on the general framework which obliges the research team to choose an example for each item. Consequently, the reader can get a clear picture about this report. This study is based on interviews with current and former sharia leaders in addition to visits to sharia courts and bodies. The emergence of sharia leaders came with the first appearance of the Free Syrian Army during the second half of 2011, where some local groups related to the FSA started to face complications that neither defected officers nor civilians were able to handle. This situation obliged locals to seek the opinion of sharia leaders, which is known tradition in Syrian society. However, local imams and sheikhs faced problems in dealing with many issues such as captive’s, informants and commitment to funds and properties (known as loots later) due to the lack of experience and precedent knowledge. Such dilemma’s led to the emergence of the first sharia body and religious scholars made sure to form committees that included many imams for issuing fatwas in order to avoid any individual responsibility. These committees turned into almost permanent bodies due to the rapid escalation of events and issues. The local sheikhs and FSA factions opposed the spilling of bloodshed and looting contrary to the foreign sharia leaders and those who studied in a certain sharia school. However, those sharia leaders did not integrate with the structure of the FSA factions and worked independently. With the appearance of Islamic factions at the end of 2011 the position of sharia leader was established as part of the structure of the faction. This approach was later adopted by all factions including factions within the FSA. Since its establishment in Afghanistan, Al Qaeda has relied on many sharia leaders such as Abu Laith Al Libi and Mahfouz Weld Al Waled (Abu Hafs Al Moritani) and others. The emergence and growth of Salafi factions took place between 2011 and 2013 and the phenomenon of “Islamization” spread to other factions as an attempt to follow the same course of the Salafi factions to attain funds from external donors and gain local support. Moreover, some factions had replaced the flag of independence with other banners such as oneness of God or other religious symbols, while other FSA factions have adopted the sharia courts alongside rejecting the civil laws both implicitly and explicitly. On November 10, 2012, Al Tawhid Brigade, Al Nusra Front, and Ahrar Al Sham Movement established the “Sharia Body” in Aleppo, who depends on rulings from the Islamic sharia. Many other factions have joined the Sharia body such as Jaysh Al Fateh, Fastaqim Union, Liwa Ahrar Souriya, and Al Nasr Union. However, Al Nusra front defected later and established its own Sharia body entitled “The Courthouse Levant ”. Sharia judiciary was an important issue for Salafi factions, considering it as “giving judgment in accordance with the instructions of Allah”. This issue caused friction and led to many clashes between those who believe in sharia and those opposing it, who advocate another justice. Salafi factions believe that the implementation of sharia should be prioritized over fighting Assad’s forces However, this principle has led to conflict with the local communities and other factions. Moreover, the number of sharia courts reached about 20 after controlling Idlib Province, where all these courts were unified under the leadership of the “Sharia Judiciary Council” in Idlib. This council has failed to fulfil its functions at the expense of enhancing the role of sharia bodies due to different reasons which include: courts lacking independence because of their connections to other factions, the weak executive force of this council, lack of experience and scientific competencies with regards to judicial and legal aspects, and the lack of a unified legal reference for the council. The situation is almost the same in Eastern Al Ghouta because many factions established sharia bodies and neutralized the roles of many judges and legal individuals who defected from the Syrian regime. Conversely, the experience of the “Courthouse in Hauran” has presented a different model of sharia judiciary because it was able to unify the judicial bodies of all factions including Al Nusra Front in addition to accrediting the Uniform Arab Law. While ISIS rejection may lie behind the assassination of Bashar Al Kamel on September 1, 2015, and Usama Al Taim on the 15/12/2015, as both of them were the founders of this courthouse . After 2015, the trend of Islamization started to decline considerably due to different reasons, most notably: the lack of military achievements by the Salafi factions after the second half of 2015, inter-faction fighting, the backing of regional countries, that used to tolerate the discourse of Islamization had declined. Thus, this gradual decline has led to reducing the Islamic trend of different factions including the Salafi ones. Furthermore, the role of sharia leaders has been reduced considerably, obliging many sharia bodies and sharia leaders to accept some forbidden procedures such as lifting the Syrian independence flag and working with the Uniform Arab Law. Second: Who are the Sharia leaders? The manifestations of sharia leaders were similar to their roles in Syria because these roles had begun in the end of 2011 in order to handle certain problems at the communal and neighborhood level. After that, sharia leaders became actors within the Syrian opposition’s areas and their roles expanded through issuing certain fatwas to the judicial system in addition to supervising the enforcement of sentences, promoting factions, justifying the conflicts between the factions…etc. Following the emergence of military factions and what followed from divisions and military clashes, the sharia leaders turned into a main component within the structure of any faction and a tool for confronting other factions. Alongside these sharia leaders a group of autonomous sharia leaders emerged who were either a handful of individuals who did not have any affiliation to any faction or from those who defected and abandoned their own factions. Generally, the members of that group were few in number despite their influencing role in Syria. Sharia leaders are divided into two parts according to their sharia achievements as follows: the first part has studied sharia in Islamic institutes, Sharia colleges, or Islamic schools, while the second part attended training courses about sharia that took place within the faction itself . The latter is well-known for rhetoric and preaching after gaining a limited knowledge about sharia. Furthermore, there is an overlap with regards to the roles of sharia leaders, politicians, and combatants because there are many political and military persons that have sharia certificates such as Zahran Alloush, commander of Jaysh al-Islam and head of sharia body, in addition to those who attained their sharia experience in prisons or from certain sharia schools. The sharia leaders play different political, religious, and military roles such as Sameer Kakeh, successor of Zahran Alloush and Hashim Al Shaykh, a former commander in Ahrar Al Sham Movement and a current head of the advocacy and guidance body despite the fact that the latter did not have any sharia experience. There is no certain group, ideology, or roles for sharia leaders, as they have different affiliations, nationalities, skills, network of relationships….etc. Sharia institutions have also emerged and formed an interrelationship with sharia leaders and sometimes disputes may take place between the institution and the sharia leader. 1. Salafi Jihadist Ideology whether if it is globalized or localized. This ideology can be found in the sharia leaders of Al Nusra Front. 2. Activist Salafi Ideology: includes Ahrar Al Sham Movement, Islamic Sham, Hauran Courthouse, and some factions in Daraa such as Al Muataz Brigade. 3. Scientific Salafism: mainly includes sharia leaders in Jaysh al-Islam in Eastern Al Ghouta and The Authenticity and Development Front in Idlib and Deir ez-Zor because they have a presence in Duma and Al Qalamoun areas which are influenced by the Hanbali School. 4. The Religiosity of Levant Ideology: includes factions in Homs and its northern countryside and other factions that used to be active in Aleppo such as the Levant Front, Faylaq Al Rahman which is positioned in Eastern Al Ghouta, and Ajnad Al Sham which is positioned in countryside of Hama. Before analyzing the role of sharia leaders, we will focus on the roles of three significant groups because they have influenced the sharia scene in Syria. Between 2012 and 2013 many foreign sharia leaders joined Al Nusra Front and only few of them joined Ahrar Al Sham Movement. Many of those individuals have defected and joined ISIS after its establishment in April 2013. The number of foreign sharia leaders has decreased considerably through the last three years after being targeted by airstrikes from the international coalition and many were assassinated by unknown individuals especially in the Idlib Province. On September 10, 2014, Al Nusra Front-affiliated, Abu Mashari (Jordanian) was assassinated by unknown individuals in Al Qanina village near Jisr Al Shughur in Idlib countryside. January 31, 2015, Ahrar Al Sham-affiliated, Abu Usayd Al Jazrawi (Saudi) was killed during conflicts with Al Nusra Front in Binnish city, as he was the judge of the city. October 4, 2016, Ahmad Salama Mabrouk (Abu Faraj Al Masri), an ideologue in Al Nusra Front was killed due to an airstrike by the International Coalition near Jisr Al Shughur in the countryside of Idlib. November 18, 2016, Abu Afghan (Egyptian), a sharia leader in Al Nusra Front was killed due to an airstrike by the International Coalition. July 7, 2017, five sharia leaders were killed in Al Quneitra Institute for Sharia Studies in Al Quneitra village in Idlib Province because of a car bomb explosion. The institute was managed by Abu Yahya Al Masri, whilst Abu Madawi Al Jazrawi, Abu Usama Al Jaza’ri, Abu Al Hareth Al Libi were among the assassinated characters. September 13, 2017, Abu Mohammed Al Madani Al Hijazi (Saudi), sharia leader in HTS was assassinated by unknown individuals in Saraqeb city in Idlib countryside. September 15, 2017, Suraqa Al Makki (Saudi), a sharia leader in HTS was assassinated in Idlib city by unknown persons. September 20, 2017, Abu Yahya Al Tunisi and Abu Suleiman Al Maghribi were assassinated by unknown individuals in Al Kurneesh Street in Idlib city. Syria has also witnessed the death of many Syrian sharia leaders who came from overseas such as Abu Firas Al Souri, as he was targeted by an American airstrike in Idlib on April 3, 2016. 1. They have a broader influence with regards to the policy of their factions such as HTS, where sharia leaders have a presence in the Sharia Committee and the shura Council. The most prominent foreign sharia leaders in Al Nusra Front include: Abu Suleiman Al Muhajer (Australian who is form Egyptian origin) and Maysara Al Jabouri (Abu Mariya Al Qahtani, who has an Iraqi nationality) Sami Al Aridi (Jordanian). 2. The ability to recruit combatants and attain funds from abroad due to their wide network of social and religious relations especially, in the Arabian Gulf contrary to the local sharia leaders. 3. They have an international experience thus, they can present sharia and jihadi experiences from other societies, while local sharia leaders lack such experiences. It is notable that the majority of foreign sharia leaders who are active in different factions, including ISIS, came from Saudi Arabia, Egypt, Jordan, and Tunisia. On the other hand, most of those who came from Jordan and the Arabian Gulf are extremists and takfirist and joined ISIS later such as Turki Al Banali. Furthermore, those who came from Egypt were mostly in their 50s and 60s and joined Ahrar Al Sham, as they have extensive experience in the Jihadi School. In addition to the sharia leaders that came from abroad, it is important to mention the role of many sharia leaders and ideologues who reside in other countries such as Saudi Arabia. These sharia leaders have provided fatwas and guidance to Salafi Jihadi groups especially, Al Nusra Front and ISIS via different communication and media tools. Furthermore, some of those individuals have incited and mobilized other individuals via social media in order to support these groups in addition to interfering directly to resolve the conflicts between Salafi factions. Saudi Sharia Leaders: Hasan Saleh Hamid and Abdullah Al Watban in addition to some residents in this country such as Fayez Salah and Dr. Imad Al Din Khiti. Jordanian Sharia Leaders: Abdul Kader Shuhadeh (Abu Mohammed Al Tahawi), Dr. Eiad Quneibi, and Issam Al Barqawi (Abu Mohammed Al Maqdisi). The presence of autonomous sharia leaders is another phenomenon that took place inside and outside of Syria. These individuals lack executive force that the factions’ sharia leaders have, especially Al Nusra Front. However, the autonomous sharia leaders were able to conduct difficult tasks that their counterparts could not fulfil. The most prominent task for them is conciliating between different factions through sharia bodies or individual initiatives, whilst factions’ response to such initiatives varies as per the willingness of the military commands. Moreover, autonomous sharia leaders conduct other tasks such as advocacy, guidance for FSA’s combatants along with preachingto the populace. Abdul Razzak Al Muhdi , Abdullah al-Muhaysini (became sharia leader in HTS later), and Musleh Al Aliani (Saudi) are the most prominent autonomous sharia leaders in Syria. It is worth mentioning that Abu Mohammed Al Julani was able to attract most of those individuals during the foundation of HTS, granting this faction an additional force at the expense of Ahrar Al Sham, which explains the weakness of HTS’ project after the dissent of most of those autonomous sharia leaders. • Shura Council for Ahl Al Ilm (Scholars): headed by Dr. Saad Al Othman and includes sharia leaders who reside in Syria. This council gained the green light from Al Nusra Front before the conflict that took place between the latter and Army of Mujahideen. • Scholars’ Union includes sharia leaders of the Salafi factions and other sharia leaders outside Syria. Abu Mariya Al Qahtani, Abdullah al-Muhaysini, Abbas Sharifeh, Ahmad Mohammed Najeeb (head of the judicial body in Ahrar Al Sham), and Ayman Haroush (member of Sharia Council in Ahrar Al Sham). However, the union’s fatwa with regards to Euphrates Shield operations has caused the withdrawal of many sharia leaders including those affiliated to Ahrar Al Sham. • Scholars of Sham’s Association: led by Mohammed Al Muhaysini and includes a great number of foreign sharia leaders who were specialized in mediating between the Islamic factions. This association has lost its popularity after accusations of being biased to Al Nusra Front. 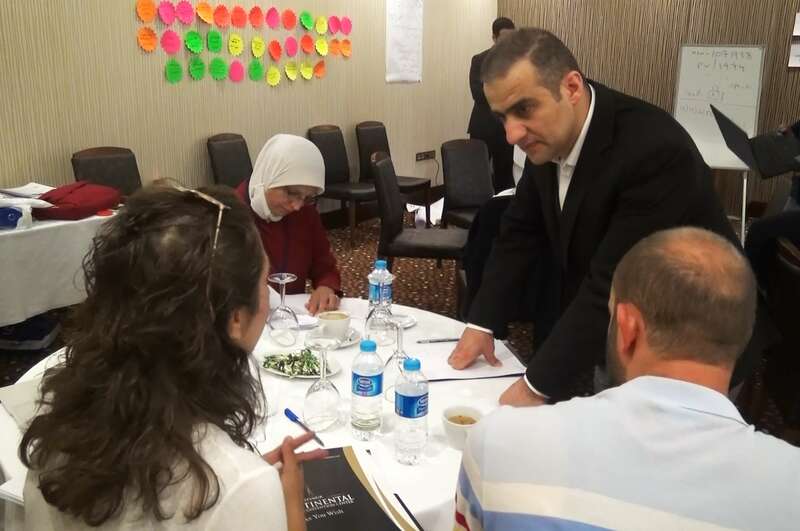 The relatively free areas witnessed the emergence of many civil society organizations including bodies of scholars and preachers, councils, and sharia bodies inside and outside of Syria. Many prominent groups were founded in the past years which include: Syria’s Scholars in 2006, Islamic Sham Body on October 3, 2011, Syrian Scholars’ Association in May 2011, Kurds Scholars Association in October 2011, Ulamaa and Khotabaa Free Body (the Body of Free Scholars and Preachers) on May 11, 2012, the Syrian Islamic Forum in January 2012, Sham Khotaba League on November 2, 2012, the Front of Aleppo Islamic Scholars on April 11, 2012, and the Syrian Islamic council on April 14, 2012, which includes some of the above-mentioned bodies. The roles of these external bodies vary according to many criteria’s which include: the extent of the body’s influence on faction\factions, locals of the area, the size of funding, and the regional influence that the body has. Those bodies lack real representatives on the ground contrary to the local sharia bodies despite the presence of apprentices who were instructed by certain sheikhs but have failed to form any effective force. 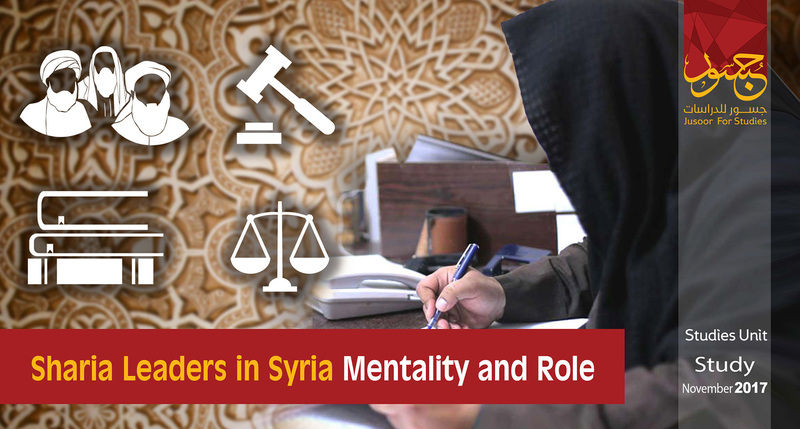 The roles of those external bodies are intersected with the roles of sharia leaders and bodies, as their main task is to provide fatwas and sharia opinions on the current issues that face Syrian society. However these bodies were taking a long time in this regard and preferred issuing joint statements rather than quick and individual ones . Furthermore, many programs and advocacy projects are being organized in Syria through these bodies in order to complete the projects conducted by Sharia bodies within the factions resulting in the suspension of some projects by the last party in order to avoid any embarrassment ! The external sharia bodies along with their members play political roles, where they have seats within the National Coalition and the National Council in addition to the personal or corporate participation of many members within some political formations. Furthermore, these bodies adopted a number of political initiatives and issued political statements . Sharia leaders’ tasks varied as per the faction, as they can conduct them at the internal and external levels. These tasks could be political, military, social, or economic. However, these tasks varied according to sharia leaders themselves due to different reasons such as their charisma, relations with the commander of the faction, their ability to attain fund, and surpassing other sharia leaders in regards to fulfilling their roles in the same faction. Abdullah al-Muhaysini is considered the most prominent sharia leader whose role has influenced many factions. Sharia leaders conduct many tasks inside the faction such as providing fatwas and sharia opinions in addition to political and military roles, which differ between one faction and another. 1. The role of Sharia and legitimate justification of political, economic, and military decisions that are made by the faction. For example, many sharia bodies within Ahrar Al Sham and Jabhat Fateh Al Sham (Al Nusra Front previously) issued statements that represented the position of each faction towards the launch of the Euphrates Shield in Syria. 2. General Guiding and Advocacy Role, Ahrar Al Sham’s office for advocacy and guidance organizes sharia sessions for locals, religious lectures at mosques, and programs for memorization of the Holy Quran. Similar initiative have taken place by HTS and Jaysh al-Islam. In this context, the significant role of Islamic Sham Body can be seen through the great number of advocacy programs and projects that have been presented since 2011 to the present day. 3. Mobilization and Preaching Role, which focuses on guiding the combatants of the faction , improving their morale before the battle, patrolling the military points regularly, and providing special programs for militants who storm the enemy lines before the start of the battle, as the latter activity is well-known in HTS. Moreover, foreign sharia leaders guided many factions especially after their arrival in Syria, as many FSA factions asked for their help in order to advise their combatants. 4. Partaking in the formation of the internal policy of the military movement, such role differs as per the faction. Sharia leaders in Ahrar Al Sham Movement have two seats in the shura council for making decisions, while sharia leaders have a larger presence and participation in decision-making in HTS, where the sharia council is the utmost authority in HTS. 5. Handling the justice system in rebel-controlled areas, as sharia leaders partake in investigating, issuing judgments, and supervising the execution of sentences . Those individuals depend on their own understanding of sharia judgments without referring to any legal texts that can help other judges in the faction. 1. Countering the sharia discourse of other Islamic factions through presenting sharia discourse that justifies the faction’s practices. Such role can take place by statements or debates, whereby the past few years have witnessed a great number of debates between sharia leaders of different warring factions. 2. Promoting the faction inside and outside of Syria for attracting public support, where sharia leader visits mosques and markets for this purpose in addition to using social media. 3. Raising funds through the direct relation between the sharia leader and the donor (from the Arabian Gulf most of time), or his relation with religious men outside of Syria. 4. Offering reconciliations and mediation, as autonomous sharia leaders work on the convergence of views between the fighting factions in addition to proposing agreements between these factions after coordinating with their military commanders. Forth: What did Sharia Leaders’ Experience Present and what has it Gained? The emergence of sharia leaders was in line with the start of the armed action in Syria because the newly formed factions could not handle the legal and political situations due to the lack of references in this regard. The extensive expansion of sharia leaders’ roles as a result of the Islamization phenomenon has turned those individuals into part of a problem rather than a solution such as Al Nusra Front who has become a burden for FSA factions. The presence of sharia leaders has weakened the judicial institutions considerably because of repealing the Syrian Civil Code and rejecting other laws such as the Uniform Arab Law . Furthermore, judgments of the justice system are based on the moods and understanding of the sharia leaders without the presence of any reference code. Sharia judgment has also cancelled any gradual verdict thus, no legal body was able to conduct any appeal in addition to cancelling the trial advocacy for the defendant and the minimum principles of fair trials. Consequently, sharia leaders were responsible for many judgments that were not in accordance with the legal standards because most of those individuals do not have any academic qualifications in regards to law or even a thorough knowledge of jurisprudence and the majority of factions did not seek the help of experienced or specialized judges . Sharia leaders have failed to introduce any positive model for the justice system due to the lack of fair trials and the presence of bribery, cronyism, and other types of corruption. The division between the armed factions has led to another split between the executive judicial bodies and police apparatus, causing chaos in Idlib and Aleppo provinces (before the withdrawal of the Syrian opposition from Aleppo city in 2016), where filing a complaint about a murder or an offense meant communicating with all factions in the area who already did not approve any exchange of information between each other. Sharia leaders made things worse because they did not try to stop the division between those factions or even pressing on their military commanders thus, locals have lost the majority of their legal rights. The presence of sharia leaders has also created a gap within the sharia institutions and the classes of society, as the majority of sharia leaders are mainly from those who graduated from Sharia Colleges and institutes, in addition to young scholars and individuals who were at the lowest degree of the pole before 2011. These individuals have now the legal authority to make big decisions such as death sentences, closing the crossings, justification of any conflict with other factions, or even the evacuation of thousands of locals. While the respected traditional sheikhs became refugees in the neighboring countries without being able to influence the realities on the ground. There is a mutual disrespect between sharia leaders and traditional scholars (sheikhs), whereby the latter deem sharia leaders as intruders who had a negative impact on sharia, whilst sharia leaders consider those scholars as traitors who preferred to abandon their country and people. Foreign sharia leaders have widened the gap between the Islamic factions and Syrians because of the different cultures. Furthermore, their experience with jihadi movements in Afghanistan and Iraq has led to futile conflicts in Syria. Sharia leaders in Salafi factions caused and justified bloody armed clashes, significant divisions, and lack of freedoms in the Syrian arena due to their fatwas with regards to prominent issues knowing that the same individuals retracted those fatwas after a few years without showing any explanations or excuses. The most prominent fatwas were as follows: raising the Syrian independence flag is forbidden, rejecting the Uniform Arab Law, rejecting the recognition of the Syrian State or the usage of the word “Syria”, prohibiting the launch of any battle against the Turkish Armed Forces in Euphrates Shield, and other fatwas. All these fatwas are related to Al Nusra Front or Ahrar Al Sham, while no justifications or apologies were made after retracting any fatwa that caused futile clashes among Syrians. The phenomenon related to the emergence of sharia leaders after 2012 has a negative impact on both the Syrian scene and the Syrian society in the rebel-controlled areas. This phenomenon needs more study and research in regards to different aspects, whereas a comparative study about all fatwas that were issued by sharia leaders or bodies should take place in order to analyze their political and sharia framework. 1- This report refers to sheiks as individuals who have Islamic character and religious knowledge in sharia studies. They wear religious clothes as per a certain occupation and locals call these individuals “sheikhs”. Research team thinks that this term is the closest to define this group of people. All references with regards to scholars in Syria or other countries do not define the term “scholars and preachers”, as we could not reach any definition despite reviewing the references of Islamic Sham Body, Olamaa and Khotabaa Free Body (the Body of Free Scholars and Preachers), Rabitat Olamaa Al Sham (the League of Sham Scholars), and the Syrian Revolution Scholars and Preachers (SRSP) foundation. Further, we could not find any definition for non-Syrian organizations such as the League of Muslim Scholars. 3- Despite the ambiguous biography of some sharia leaders especially, foreigners and the lack of videos about them, they were recognized by the local society since their first appearance contrary to those who work in the security forces. 4- The term “Islamic factions” appeared in 2012 and it is thought that Salafi factions such as Al Nusra Front, Ahrar Al Sham, Jaysh al-Islam adopted this term in order to distinguish themselves from the other FSA factions because the first party focuses on the establishment of Islamic governance rather than the national one. 5- Since their foundation until now, Al Nusra Front and ISIS refuse to oblige their combatants to attend any joint or neutral sharia court, while the two organizations have their own courts for this regard. 6- On the 20/1/2016, the Courthouse issued an official accusation towards some combatants of Islamic Muthanna Movement (affiliated to ISIS) concerning the assassination of Usama Al Taim and demanded the movement to hand over the perpetrators. However, Al Muthanna movement denied the accusations. 7- Some Islamic factions especially, Ahrar Al Sham conducted courses to prepare sharia leaders and judges. The last few years, Ahrar Al Sham established an institute to train judges in Antakya city in addition to training sharia judges from the Arabian Gulf such as Abdallh Al Watban, the general supervisor of Al Muhtasib Center and website. 8- Abdul Razzak Al Muhdi was able to keep his independent position between factions including HTS as a neutral arbitrator. 9- For example: the initial statement was issued by sharia bodies with regards to ISIS on December 21, 2013, after 8 months of the emergence of this organization who killed dozens of people. 10- Clashes between Al Nusra Front and the Body of Free Scholars and Preachers who is affiliated to Muslim Brotherhoods (MB), where some conflicts took place in mosques along with forcing the imam to stop his speech in the mosque. Such clashes have confined MB’s influence in areas controlled by Salafi factions. 11- For example: the Syrian Islamic Council presented an initiative about establishing a unified national army under the command of the Ministry of Defense in the Syrian Interim Government (SIG) end of August 2017. 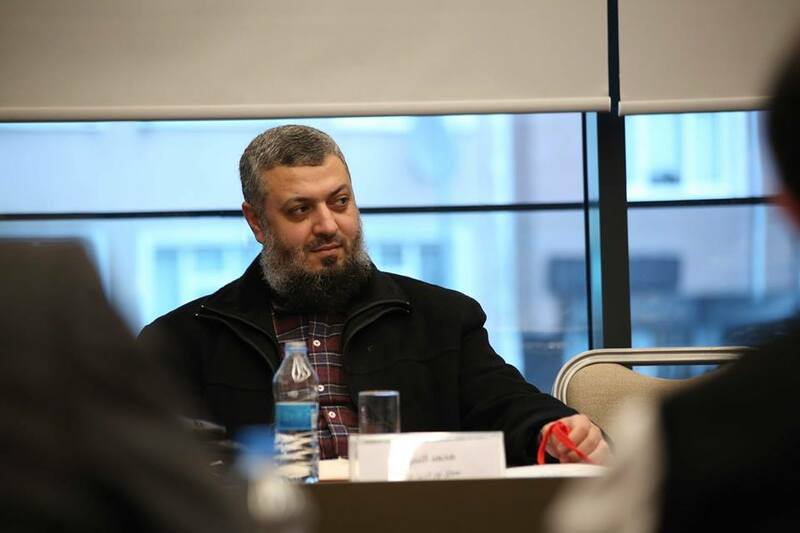 13- Mohannad Al Masri, a former head of the movement restructured the general sharia office and entitled it “Advocacy and Guidance Body” on November 17, 2015. The decree included the assignment of Hashim Al Sheikh as a head of the new body. It is worth mentioning that Al Masri has defected from Ahrar Al Sham and HTS. 15- For example: sharia leaders supervise the executions and visit prisons to make sure that torture against prisoners is forbidden or to supervise the torture and interrogation process by themselves. 16- On September 12, 2017, Abdullah Al Muhaysini and Musleh Al Aliani, members in HTS’ sharia council declared their resignation after leaks showed criticism towards sharia leaders by HTS’ commanders, as Abu Hamza Binnish, emir of Idlib sector requested from a person called Nayef –who is thought to be Abu Mohammed Al Julani- to arrest Abdullah Al Muhaysini in case he visited HTS’ guest houses which were preparing themselves to fight Ahrar Al Sham. However, Nayef turned down Abu Hamza’s request and told him to prevent Al Muhaysini from entering the guest houses. Another leak showed an audio recording between Abu Hussein Al Urduni, commander of the central army and Abu Hamza Binnish, as the latter said that he planned to arrest all HTS’ sheikhs in order to prevent the establishment of any sharia body that could solve the conflict with Ahrar Al Sham or urging HTS’ combatants not to fight. 17- Most of the factions including Ahrar Al Sham retracted their decisions and adopted the Uniform Arab Law on 18/6/2017. 18- Some sharia courts have gradual verdict especially, judgments in regards to executions which normally needs three steps, but these steps are not regulated in the civil jurisdiction. 19- Interviews took place between the preparation team and a number of sharia courts’ judges in Aleppo and Idlib countryside, where it turned out that all of those judges were imams at mosques before 2011, while they have now the authority to give death penalties bout criminal and political offenses. Further, two of those individuals don’t even have university degree in Law or Shria!